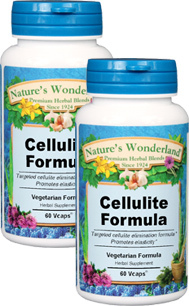 Cellulite Formula - 600 mg, 60 Vcaps™ each (Nature's Wonderland) - Penn Herb Co. Ltd. When the body's circulation and elimination process is off balance, cellulite, a combination of fat, water, and trapped wastes begins to form beneath the skin. Cellulite Formula supports fat metabolism and healthy circulation. Garlic…supports circulation and blood vessel health. Goldenseal...cleansing root supports healthy elimination. Sage…herbal astringent helps tighten and tone tissues. Our targeted formula includes Fenugreek for healthy fat metabolism, Sage to help tighten and tone tissue, plus Garlic and other complementary herbs to help support circulation and healthy elimination.